Less than five minutes into their final matchup of the season with LeBron James and the Los Angeles Lakers, Josh Richardson has the ball on the left wing. Bam Adebayo approaches, sets a screen on Kyle Kuzma and Richardson springs free. Two dribbles. Pull-up. Jumper hits the rim and four Lakers around the paint watch it fall into the hands of Josh Hart. It’s a common type of play that every soul reading will be able to picture generally, but few will be able to do so specifically. What’s so special about that? For Miami, it’s that it doesn’t happen much anymore. And that’s just the first part of this story. Like most teams, the HEAT came into this season with an eye for reducing their mid-range jumpers, or at least those ones that categorize as Bad Math by being contested or early in the shot clock. In that they’ve succeeded, with long mid-rangers falling from 13.6 percent of their offense to 9.7 percent (per cleaningtheglass.com) which amounts to cutting around five of the nominal ‘Worst Shots In Basketball’ from their diet. That’s a significant amount, though their rankings in mid-range usage have remained relatively neutral since so many other teams had the same goal. Following the Moneyball ideal, all those mid-rangers would transform into open threes and layups. But ideals are easier said than accomplished and even the most sound strategic decisions on paper still have to play out on the court. In cutting around five mid-rangers, they’ve added about four non-rim paint shots – the difference between taking the 23rd most shots from that zone to taking near or exactly the most, depending on which database you’re using. For our purposes, we’ll refer to those non-rim paint shots as floaters (they're also runners and other miscellaneous shot types). It’s been six years since the HEAT shot at least three percentage points better on floaters than from mid-range. Some years they’re actually better from mid-range. As the HEAT tried to get rid of the worst shots in the game they effectively traded them for the same shots, as far as efficiency goes. According to Second Spectrum’s database, Miami’s Shot Quality is effectively unchanged since last year. Good intentions they may be, nothing was gained nor lost on this venture. Or so it would seem. Unlike most teams, the HEAT came into this season with an eye for upping their offensive rebounding rate. Conventional wisdom, popularized in part by Doc Rivers in Boston, of the last decade or so has been to forgo offensive boards, to a degree, in order to maximize the players getting back in transition. As recently as 2013, the league offensive-rebounding percentage had been hovering around 27 percent for years. Last year it fell to 22.3 percent. The faster the game gets, and the more threes being taken, the more teams have emphasized retreating and setting up on defense. Erik Spoelstra has generally agreed with the trend over the years, but he wanted to take a second look at it. Maybe there was an inflection point, and they had gone too far in one direction? “We were just trying to find different ways that we could generate offense,” Spoelstra said. With Eric Glass coaching the HEAT’s Summer League team – like many teams, the HEAT often use Summer League as a laboratory, having previously tested out various schematic changes before deciding on their regular-season use – Spoelstra asked Glass to try crashing the glass a little more. 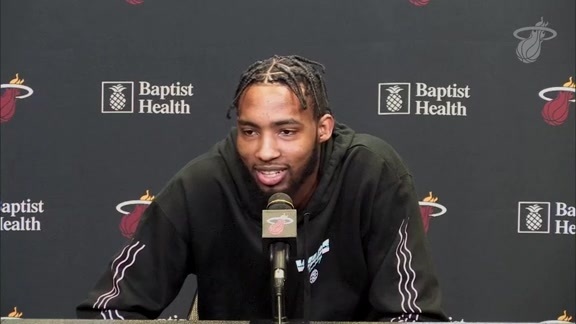 Bam Adebayo and Derrick Jones Jr. being on the roster made it a timely request. “That is a major emphasis right now in Summer League,” Glass said when asked about Jones Jr. in July. To the point that Adebayo and Jones Jr. started a competition among themselves that has carried over into the regular season: who can get the most offensive rebounds? “We don’t necessarily keep count, but we know it’s still a challenge. We go out there and just try to get as many as we can,” Jones Jr. said. Both players recalled a rebound from the recent game at New Orleans when both had the ball within their grasp. Adebayo says he let Jones Jr. have it, Jones Jr. says he had to pull the ball low to the ground to keep it away from Adebayo, who wouldn’t let it go. Separately, Adebayo jokes how unfair it is that Jones Jr., who excels at flying into the lane for long rebounds off three-pointers, doesn’t have to deal with as many box-outs. Clearly the Summer League was a success because Adebayo and Jones Jr., along with Hassan Whiteside, appear to have just as much of green-light to attack the glass as Wayne Ellington and Kelly Olynyk do from beyond the arc. The HEAT were No. 21 in Offensive Rebounding Percentage – the percentage of all their misses that they re-collect – last year and are now No. 4 after boosting their rate by 4.5 percentage points. “Last year we weren’t even going to the glass,” Spoelstra said. Better yet, with Jones Jr. posting one of the best offensive rebounding seasons for a wing in over a decade and both Whiteside and Adebayo in the league’s Top 20, the HEAT are the best team in the league at rebounding their own two-point misses. By no small margin, either. For a team that currently sits in last place at shooting two-pointers, the volume of second and third chances they’re earning amounts to nothing less than a saving grace for their offense – at least coupled with their ability to generate threes. With various research groups addressing the topic with a scientific approach over the years, it’s generally accepted that the shorter the shot the shorter the rebound. It stands to reason, then, that with Miami reducing their average two-point shot distance a full foot since last season, the average rebound on their own misses was going to be shorter as well. All two-point shots aren’t made equally. With the way defenses operate these days, a pull-up jumper is often contested by the small defender in a pick-and-roll or handoff, meaning there is a man between the shot and the rim. And because those jumpers are taken earlier in a developing action, a big man doesn’t always have time to set a good screen and roll deep into the lane. This isn’t the easiest rebound in the world if you’re Bam Adebayo. Floaters, by nature, are taken closer to the rim. You take floaters on a drive, after a burst of speed to get past a defender hung up on a screen or handoff. Even if they’re not a significantly higher percentage play, floaters inherently draw extra defenders – often an extra big man – because if nobody helps, that floater could easily become a layup. “Don’t get blocked down there and it gives them a chance for a rebound,” Richardson says. Coupled with the fact that floaters are also softer shots in general, less prone to careening off the rim at wild angles, and the HEAT, both inadvertently and advertently, have created a lucrative rebounding environment. “Those soft touch shots, it helps a lot because the ball has a lot less force going to the rim and you have a better chance,” Jones Jr. said. Basketball is funny. The HEAT set out with two specific goals this season. One of them has worked part of the way while the other has been more successful, but it’s the shortcoming of their shot distribution goals that may be helping to create the success of the latter. Miami’s commitment to player development habits are always front and center, but Spoelstra is willing to accept that some unseen ancillary benefits are also helping them out. Sometimes you play the game, sometimes the game plays you and sometimes the game plays itself in ways that aren’t entirely expected but are nonetheless beneficial if properly recognized.